A new book co-edited by Professor John Doyle, Director of the Institute for International Conflict Resolution and Reconstruction and Cornelia-Adriana Baciu, Ph.D. Candidate in Politics and International Relations, School of Law and Government, Dublin City University has been recently published by Springer International. “Peace, Security and Defence Cooperation in Post-Brexit Europe: Risks and Opportunities” examines the impact of the Brexit process on future EU-UK relations and specifically on strategic aspects of peace, security and defence. 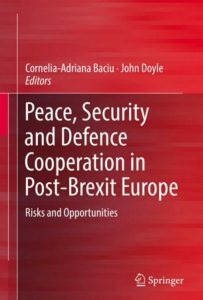 Commenting on the publication, Cornelia-Adriana Baciu, noted “This book is significant because it contributes to a better understanding and management of anticipated challenges and sources of instability in European and international security, associated with the Brexit process. With research to date not having yet determined the necessary concrete steps to sustainably protect and advance the peaceful and democratic order on the European continent, this book fills a crucial scientific gap by examining the impact of the Brexit process on key strategic aspects of peace, security and defence cooperation. The new publication features contributions from well-known senior academics in Europe from the London School of Economics, Hertie School of Governance, European University Institute and University of Grenoble. The book can be pre-ordered here and is available in e-book here.